UFC is an American mixed martial arts organization that held its first-ever event in 1993 in McNichols Sports Arena in Denver, Colorado. Ever since it has continued to gain popularity rapidly with fighters adopting effective techniques from different disciplines like boxing, Muay Thai, karate, sambo and judo. As it gained viewership, it expanded even more with TV deals in Asia, Australia, Europe and even new markets within the United States. This brought a great turn up in revenue in millions of dollars as well. Currently, 21st Century Fox has the media rights which will be replaced with Disney Direct-to-Consumer and International and ESPN Inc. in January 2019. For those without cable who wish to watch each fierce action live can watch UFC on Kodi and enjoy the thrill of each weight class easily. The list of official broadcasters for UFC are as in the list below. Though from 2019, 21st Century Fox will hand over rights to ESPN Inc.
UFC 229 is the fierce, anticipated battle of McGregor vs Khabib; which is the main event. The event date is October 6, 2018, which will be held at the T-Mobile Arena, Paradise, Nevada. Find the live stream and enjoy the match live! The best addons to watch UFC on Kodi are those that are proven to be reliable around. Shutdowns of Kodi repos and addons happen all the time. You may be engrossed in the match one minute and the next you are thrown back to the main menu. Listed are Kodi addons that are excellent for streaming UFC on Kodi along with other MMA, NFL, NBA, and other sports events. Even if you are in a country where any of these channels are geo-restricted, then just connect to FastestVPN watch UFC on Kodi with complete freedom! Follow all the steps as it is till now and you will be sorted to watch UFC on Kodi without cable! SportsAccess is favorite most in the HD sports streaming market. The addon delivers live and archived sports, for both minor and major events like hockey, tennis, MMA, and UFC. Statistically, there are 100 sports-only channels with only 20 that have live TV options. What makes SportsAccess a great resource is that all pay per view UFC events hit this addon that fuels all of your mixed martial art needs. When the installation is complete, SportsAccess will be available on Kodi’s main menu in video addons. This is a Kodi addon which is focused on Canadian IPTV channels. Why it’s great is because it has live streams of sporting events from around the world, UFC included. On the night of the event, access the addon and go to MIC Special Events to find an available stream. You can now access the addon from home screen and enjoy UFC on Kodi! 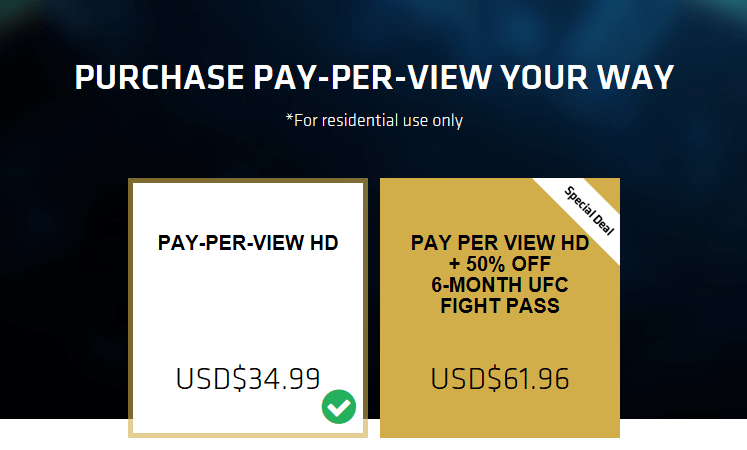 Many UFC fans purchase pay-per-view from the official site https://www.ufc.tv/events. However, it costs $34.99 for Pay-per-view HD and $61.96 for Pay-per-view HD 6 month UFC Fight Pass. 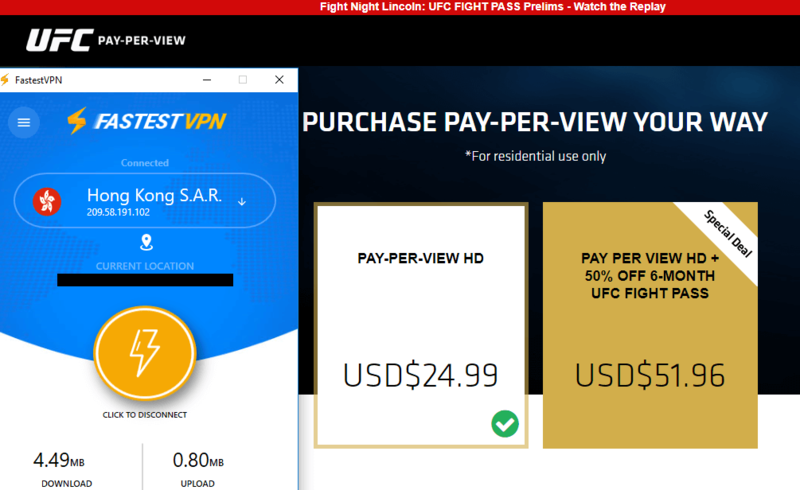 Other than privacy and anonymity, what FastestVPN has to offer is cherry on top for all UFC lovers. Get discounted pricing with FastestVPN connection! Just change your location to Hong Kong or Singapore and have the price cut down to $24.99 and $51.96 respectively. That saves you a good 10 bucks! Visit https://www.ufc.tv/events and enjoy UFC with prices cut down to $10 less! For those watching UFC on Kodi, here is the UFC 229 main card to intrigue your interests. Watch UFC 229 on Kodi from Anywhere around the World! With FastestVPN and Kodi combined, watch UFC 229 on Kodi from anywhere in the world with ease. Connect to FastestVPN and with the help of one of the addons listed above, enjoy UFC on Kodi live for free! You must be sure to be connected to FastestVPN when streaming Kodi as it is open source and may make your device vulnerable to malware and other malicious threats. Hit connect to the VPN and open doors to endless possibilities!